Ask anyone who has ever worked in a comic shop if they have stories about people coming in looking to sell some, “old comics,” and I guarantee they will have far more than one. The comic shop where I used to work had people coming in with piles of comics every week. They all thought they were going to retire, or put their kids through college off of the sale of these books. The sad truth is that most comics aren’t worth much more than a couple of dollars. No joke. But why all of the misconceptions? 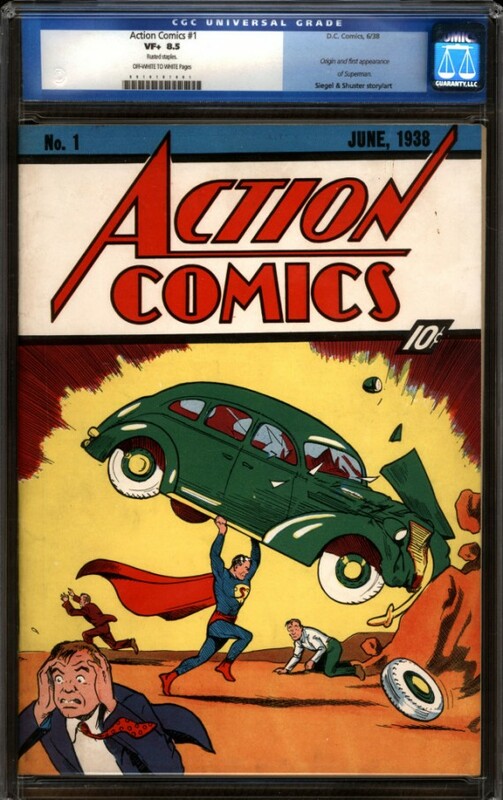 Comics as we know them today first came into existence with Action Comics #1 in 1938. That was also the very first Superman comic. In the late 30s and early 40s, many classic characters were created: Superman, Batman, Wonder Woman, Robin, the Joker, Catwoman, Captain America, the Flash, and many other characters who are still staple characters of the DC Universe. Comics quickly became popular among kids and adults, boys and girls. However, there was no collectors market, and there really wasn’t even the concept of a collectors market. So no one had any reason to save or preserve these comics. They were fun, and that was it. Then Pearl Harbor happened, and the United States entered World War II. Once the United States entered the War, Captain America and pretty much every other hero started encouraging children to buy war bonds, and recycle comic books and other household items to help support the War effort. This, inadvertently, created the secondary collectors market. As a consequence of comic books being used to help the war effort, these old pre-War comics became incredibly rare. Flash forward to the 1990’s. In the early 1990’s, stories started showing up in the mainstream media that comic books were being sold for piles of money. People were becoming rich overnight from selling their comic books. It was true; they were selling mostly pre-War comics. As a consequence, the comic industry boomed with prospectors buying up everything that they could. Print-runs ran up into the millions because people were buying multiple copies of books that they didn’t even read. Simultaneously, the general quality of comic writing plummeted. There were some good books that emerged in the 1990’s, but for the most part, the writing was pretty damn poor. Basically there were millions of books being purchased, and no one was reading them… So the market collapsed, and almost took Marvel and DC with it. And that’s the short version of the story. Here are some guidelines for comic value. People who don’t read comics understand one thing about them. “The first issue is the most valuable.” Unfortunately it’s not always true. The value is determined more by the events of a comic, the quantity in existence, the quality of the writing, or the first appearance of a crucial character. Action Comics #1 (1938) is the first appearance of any super hero, it’s also the first appearance of Superman and Lois Lane. It’s very valuable. Detective Comics #27 (1939) is the first appearance of Batman. It’s very valuable. The number on these issues isn’t what indicates the value. Similarly, there are tons of mini-series, or newer series of comics that have #1 issues, and they aren’t usually valuable. Sorry. Take a look at the copyright date. If it was made before 1945, the chances are really good that it’s pricey. If it was made between 1946 and 1969, it could easily have some value. Anything since 1970 could be worth some money, but not a whole lot. If it was made in the 1990’s it’s probably not worth the paper it’s printed on. Comics are not an investment, just as DVD’s, video games, and books aren’t investments. Get them because you enjoy them. There are so many amazing comics out there to read, find one that you connect with and have a little fun. Talk to a financial planner if you are looking to save for the future. If only I took care of my 1960’s DC comics.